IPL 2019 Season Start From Today First Match CSK V/s RCB. You Get All IPL 2019 T20 Cricket Update Like Contest Freebie Score Live Match etc Only Here. Starting Today Wai Wai IPL 2019 Fan of The Match Everyday match contest. Upload your best fan picture from home stadium or out on the streets show your support with take selfie and tag your best 10 Friends if you win your friends also win free gift hampers everyday. ag 10 of your friends. If your post wins, all of you will win a Wai Wai Gift hamper. Post your Fan picture in the comments and watch out for the daily winner announcement. read all term and guideline to increase chance to win freebie daily. 1. Wai Wai Fan of the Match contest begins on 23rd March, 2019 and ends on 12th May, 2019 at 8 pm IST. 2. Participants should feature in the photo they are submitting for the contest and should use #WaiWaiFanoftheMatch hashtag. 3. 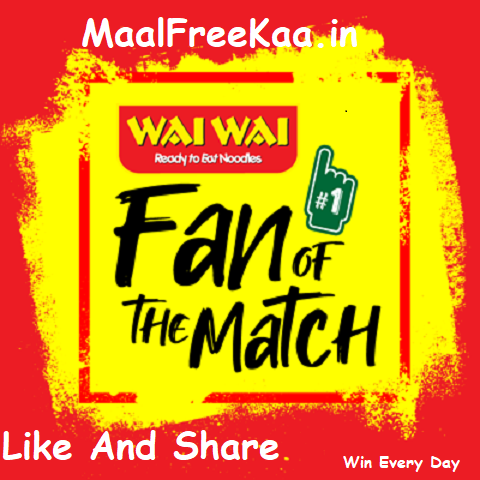 Your #WaiWaiFanOfTheMatch post should tag minimum 10 friends to be a valid entry to qualify for the prize. No tags, no prize. 4. Only one photo per participant will be accepted per day. You can post a new picture daily to increase your chances of winning. 5. Your photo must indicate IPL – celebration from the stadium or home, either solo or group and has to be from this year. A normal selfie will not be accepted. 6. The contest is open only for Indian citizen residing in India. Employees of CG Foods India, their affiliates, promotional agencies and their families are not eligible to participate in this contest. Fake, Duplicate ID’s and profile without a valid picture will not be entertained. 7. All entries will be the property of the CG Foods India. 8. By submitting an entry, entrant agrees to the use of his/her name and photo in any form of publicity or trade promotion purposed by CG Foods India and CG Foods India reserves the right to adapt, modify, edit and publish the photos as they deem fit. 9. Any local, state or federal taxes are to be borne by the winners. 10. All entries that fulfill the requirements will automatically be entered into a randomly selected prize draw. Prize draw shall take place the following day and One (1) randomly selected winner per match will be entitled to receive the price and will be contacted by Wai Wai. Each winner will win One Carton (30 pkts) of Wai Wai. Also, the tagged friends of the winner wins 30 pkts of Wai Wai each. 11. There will be no substitutions of prizes as offered except at the discretion of the CG Foods India. Prizes are non-transferable and will take 60 days to process the prize. 12. The contest may be cancelled without notice and penalty should CG Foods India deems it necessary. 13. Decision of CG Foods is final and no communication will be entertained with any participants.